Southern Illinois University Edwardsville East St. Louis Charter High School (CHS) student Rozelle Phillips has enjoyed spending the past week with Metro East law enforcement officers. The CHS sophomore is one of 60 teens, ages 12-17, who was accepted to participate in the 11th annual TeamIllinois Youth Police Camp, sponsored by the Illinois State Police headquartered in Collinsville. The CHS sophomore made his comments in light of the nationwide climate between law enforcement officers and many in the African American community, following recent police shooting deaths of black males. “Our young people are looking for guidance and discipline,” said Daron Barge, camp coordinator and Illinois State Police trooper. “I think our young people really do want structure. “This is an excellent opportunity to introduce students to the law enforcement field, especially in light of what’s been going on around the country in regards to police and race relations,” said Gina Washington, CHS director. “The camp allows youth to see that we are people, too,” said James Randolph, one of the camp co-coordinators and Illinois State Police trooper. This is Randolph’s ninth year participating. “During the camp, they learn why we do what we do. How we act at traffic stops, and the best way to interact with police,” Randolph added. The main purpose of the camp according to SIUE Police Chief Kevin Schmoll, is to establish interpersonal relationships between area youth and law enforcement in hopes of creating better understanding between both groups. Representing the SIUE Police Department among the approximate 30 police officers were Lt. Lisa Johnson and Sgt. Tara Vaughan. The week-long police camp is both geared to teenagers who are at risk of drugs, gangs, violence and other societal pressures and for those youth who are interested in a career in law enforcement. The camp is based on a military model of discipline and includes para-military drills, physical fitness exercises, classroom instruction on resisting substance abuse pressures, team building principles and other life enhancing skills. The campers experienced various activities throughout the week and came to the SIUE campus on Friday to participate in bowling at Cougar Lanes and for a barbecue cookout, prepared and served by the SIUE Police Department. The cadets will graduate at 10 a.m. Saturday, July 16 at Calvary Baptist Church in Alton. 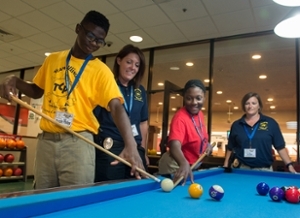 Enjoying a game of pool are (left to right): SIUE East St. Louis Charter High School student Rozelle Phillips, SIUE Police Lt. Lisa Johnson, CHS student Jamear Owens and SIUE Police Sgt. Tara Vaughan.